Paytm Mall, owned by Paytm Ecommerce Pvt Ltd has announced a Republic Day Sale from January 24 to 28. This sale will offer up to 80% off and incredible cashback offers across all categories including Appliances, Mobiles and Fashion including Apparel, Footwear and Accessories among others. To further increase the value proposition of shopping during this sale, Paytm Mall will also give away 100 couple movie vouchers to lucky winners across India. 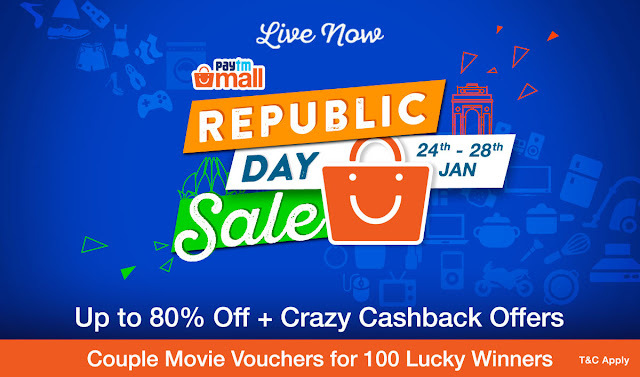 The Paytm Mall Republic Day Sale will host up to up to Rs. 10,000 Cashback on Smartphones from Apple, Google, Motorola, up to Rs 20000 Cashback on TVs & Appliances from LG Samsung Sony and up to 2000 cashback on Laptops, Cameras & more from Apple, Canon, HP & other top brands. In Apparel, Jeans from top brands will sell for up Men Jeans from Wrangler, Mufti and Killer will feature minimum 40% off and flat 40% Cashback. Women Kurtis from Rain & Rainbow, Aks and Ahalaya will sell at flat 50% Cashback. Sports, Formal & Casual Shoes footwear from Puma, Woodland, Red Tape, Nike & other top brands will be offered at up to 60% off and up to 60% cashback. Accessories like watches from Titan, Seiko and Citizen will be offered at minumum 30% cashback, Handbags from Lavie, Capresse & other top brands will be offered at 50% -80% discount. In two wheelers, Suzuki, Honda, Yamaha and TVS two-wheelers will sell with up to Rs 5000 cashback. Shop with no limits this Republic Day with the Paytm Mall Republic Day Sale!